-Brown ground lamb in a large skillet. -Stir in tomato sauce, ½ teaspoon salt and pepper. -Bring to a fast simmer, then lower heat to a gentle simmer, stirring occasionally. -While simmering, cook egg noodles until al dente. Drain and set aside. -Combine sour cream, cottage cheese and sliced onion. 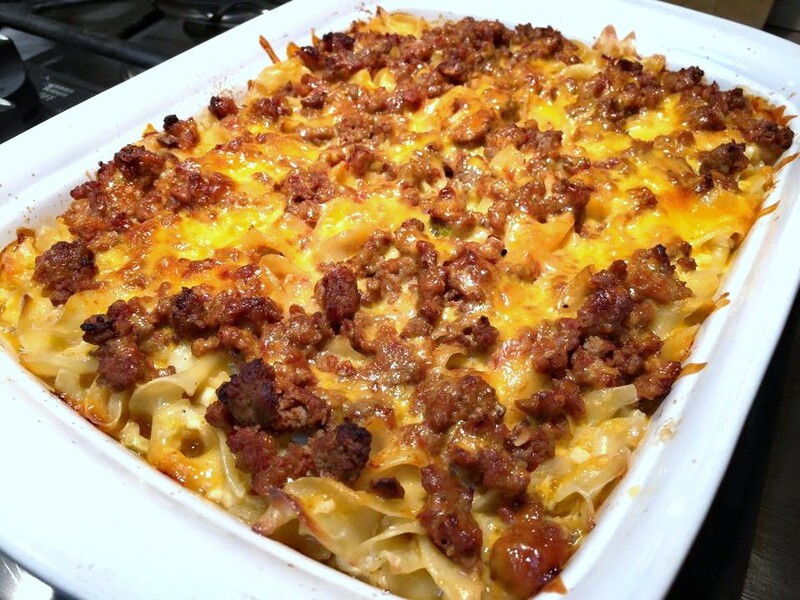 -Stir sour cream mixture, browned ground lamb, and all but a handful of cheddar cheese into into noodles. -Pour noodle mixture into a buttered casserole dish and sprinkle reserved cheddar cheese on top. May also bake in individual ramekins. **May prepare this in advance and refrigerate or freeze until ready to bake. If frozen, thaw in fridge for at least 24 hours. Allow to rest at room temperature for 30 minutes and increase baking time to 50-60 minutes or till hot and bubbly. Cover lightly with foil to control browning of cheese.